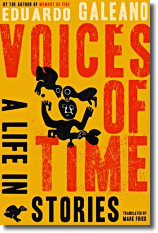 Anderson Tepper praises three recent books of Latin American fiction in the Village Voice: The Tango Singer by Tomás Eloy Martínez, Last Evenings on Earth by Roberto Bolaño, and Voices of Time: A Life in Stories by Eduardo Galeano. Click here for his review. It's tempting to generalize after reading three recent books from the southern tip of Latin America. 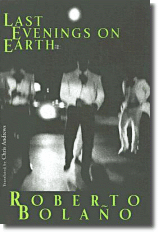 What do they tell us about the continent and its literature today? Yet what is most interesting is what the books tell us about themselves: that the era of military dictatorships in Chile, Argentina, and Uruguay, in the '70s and '80s, imbues them with an unforgettable sense of melancholy and loss, nostalgia and rage; that the spirit of Borges, more than García Márquez, hovers over these haunted tales of bloody pasts. Restless in Manhattan, student Bruno Cadogan heads to the city of his dreams, Buenos Aires, where the inflation crisis of 2001 is beginning to spiral out of control. He is on the trail of Julio Martel, a legendary but elusive singer, who he hopes will inspire and enlighten his writings on the tango. But the moment he meets El Tucumano at the airport, not only does his new friend find him a cheap room in an expensive city, but a place in the very building where Borges set his celebrated story 'The Adelp'. With El Tucumano's unpredictable help, Bruno is increasingly drawn to the mystery of Martel and his strange and evocative performances in a series of apparently arbitrary sites around the city. And as he untangles the story of the singer's life, Bruno begins to believe that Martel's increasingly rare performances map a dark labyrinth of the city's past. 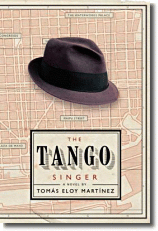 Click here for a strong review of The Tango Singer in the Independent and here for the equally positive review in the Guardian. Last Evenings on Earth contains some of the most achingly dark stories you'll read for a long time—farewell letters from a drowning generation and a dying man. Here, we travel out from Chile to Mexico City and Barcelona and beyond, following the autobiographical trajectory of Bolaño himself. And what a bedraggled lot of characters we cross: second-rate writers, fringe poets and revolutionaries, aging adventurers, insomniacs, recluses, and vagabonds. But their grainy, wayward existences don't mean they're out of focus: Bolaño has a laser eye and a frank, confessional first-person voice as relentless as it is irresistible. And, for all his praise, Tepper is hardly Bolaño's greatest fan: for that role I'm tempted to nominate Francine Prose. Click here to read her effusive review in the New York Times. "If Bolaño's writing...is an incantation—against horror, against defeat, against oblivion—Eduardo Galeano's is a bittersweet affirmation," writes Tepper. The Uruguayan author's vignettes stitch together tales of wonder and terror, love and war, and just about everything in between. Are these koans, fables, experiences, or testimonials? And why is a passage about Diego Maradona shimmying up next to ones about Rigoberta Menchú, Sebastião Salgado, José Saramago's grandfather, and an anonymous tango singer? Because Galeano, author of the groundbreaking "Memory of Fire" trilogy, is a collector of stories, a clairvoyant reared in the cafés of Montevideo who, like Bolaño, carries with him a multitude. In May, Tepper interviewed Galeano in New York for Vanity Fair "to discuss his own version of literary tapestries, the marvels—and pitfalls—of technology, and, as the World Cup commences, the unsurpassed joy of watching Ronaldinho." Click here to read the interview.